Intel Corporation is a leading semiconductor firm that applies a marketing mix that is heavily focused on advertising and public relations to promote premium-priced technological products. The marketing mix, also known as the 4Ps (Product, Place, Promotion, and Price), is the combination of strategies, tactics and tools used to support a firm’s goals in selling its products in certain target markets. Intel’s marketing mix is common among technology firms, especially because of the emphasis on advertising and the use of the premium pricing strategy. The company strategically applies this marketing mix as a way of ensuring that end-users continue buying its equipment, or equipment manufacturers’ products that contain Intel technologies, such as laptops that have Intel microprocessors. An effective marketing mix facilitates business resilience and long-term success by supporting competitiveness and efficiency in marketing. In this regard, it is essential that Intel continue to monitor the appropriateness of its marketing mix relative to the conditions of the semiconductor industry and target markets around the world. In using a marketing mix (4Ps) for technology products and markets, Intel Corporation applies advertising as a way to attract end-users and equipment developers and designers. Considering the variety of products available from the company, the marketing mix also involves a corresponding variety of potential places or venues for distribution. In this way, Intel ensures that target customers and end-users are effectively reached. The company’s devices and systems include cable modems and the Intel Compute Card. Different types of processors are available under the Processors product line. For example, these processors include Intel Core, Xeon, and Atom. The other product lines contain a wide variety of products. Some of the product lines include equipment manufacturers’ goods that contain the company’s products, such as laptops with Intel processors. These product lines show that the company has more products than the brand’s typical association with microprocessors. It is expectable that Intel will add new product lines as it continues to seek new revenue streams and enter new markets or market segments. Any new product line could correspond to changes in the company’s organizational structure (Read: Analysis of Intel’s Organizational Structure for Innovation). Such new product line would also reflect the situation of the company and the global market for semiconductors. Based on this aspect of Intel’s marketing mix, product development and strategic alliances mark the company’s organizational progress. 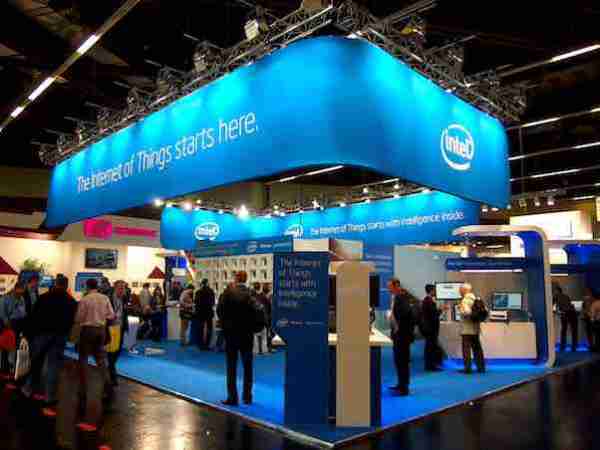 Intel Shop is the most direct venue for the distribution and sale of the company’s products. For example, the company maintains Intel Shop as part of its official website. In addition, there are physical Intel Shop locations in key areas around the world. On the other hand, the company has arrangements with IT resellers, such as retailers of parts and accessories. The authorized sellers of embedded products include sellers of computer systems that use Intel microprocessors and boards, among others. This combination of places/venues helps the company in maximizing its global market reach to distribute and sell its products. Through this aspect of its marketing mix, the company effectively applies market penetration as one of its intensive strategies for growth (Read: Intel’s Generic Strategy & Intensive Growth Strategies). Advertisements are an expensive but effective promotion activity that the company uses to boost the sales of its products and equipment manufacturers’ products containing Intel processors and boards. For example, through the “Intel Inside” advertising campaign that was launched in the 1990s, the company was able to successfully boost consumer awareness and loyalty to Intel products. The company also implements other advertisements, such as the one it used for the 2017 Super Bowl. Public relations are also a significant promotional strategy. For example, the company sponsors special events, such as science fairs for high schools. Such sponsorship supports brand awareness and customer loyalty. These public relations programs are also part of efforts to address corporate social responsibilities (Read: Intel’s Corporate Social Responsibility Strategy & Stakeholders). Moreover, the company promotes its products through direct marketing. The company engages in direct communications with equipment manufacturers and sellers to reach profitable arrangements. This aspect of Intel’s marketing mix indicates considerably equal significance of advertising, public relations, and direct marketing in supporting the company’s promotional objectives. Intel Corporation uses the premium pricing strategy to maximize its profits. In this strategy, the company’s prices are relatively higher than those of competitors, such as AMD. The advantage of this pricing strategy is that it maximizes the profit margin. A main disadvantage is that it is difficult to implement and could fail in a price-sensitive market. Intel succeeds in using this pricing strategy by maintaining a premium brand with a corresponding high perceived value, based on the perceptions of target consumers. For example, the company advertises its brand and products as leaders in the semiconductor industry. In doing so, consumers maintain the perception that Intel products are better than the competition. This condition enables the company to sell its products at higher prices and expect growing revenues despite cheaper products from competitors. On the other hand, the market-oriented pricing strategy involves determining market conditions and the prices of competitors. Intel uses this pricing strategy to guide the adjustment of premium prices. The company continues to use the premium pricing strategy as the main strategy for setting prices. Based on this aspect of its marketing mix, Intel ensures high profits through premium prices, which are supported through premium branding. Intel Authorized Distributors of Embedded Products. Intel Corporation – Official Website.